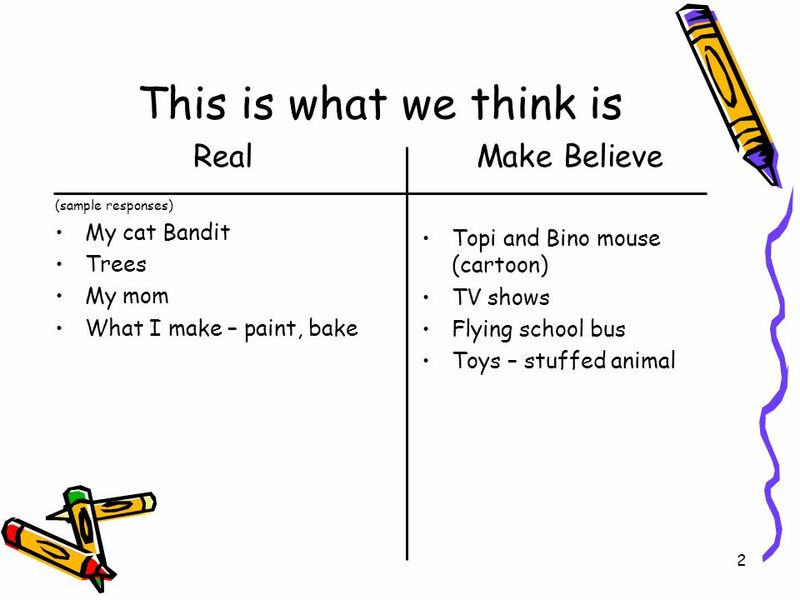 1 How do we know what is real and what is make believe? Slide Notes: Use this first set of slides (1-3) to gauge students prior knowledge about what is. 1 1 How do we know what is real and what is make believe? 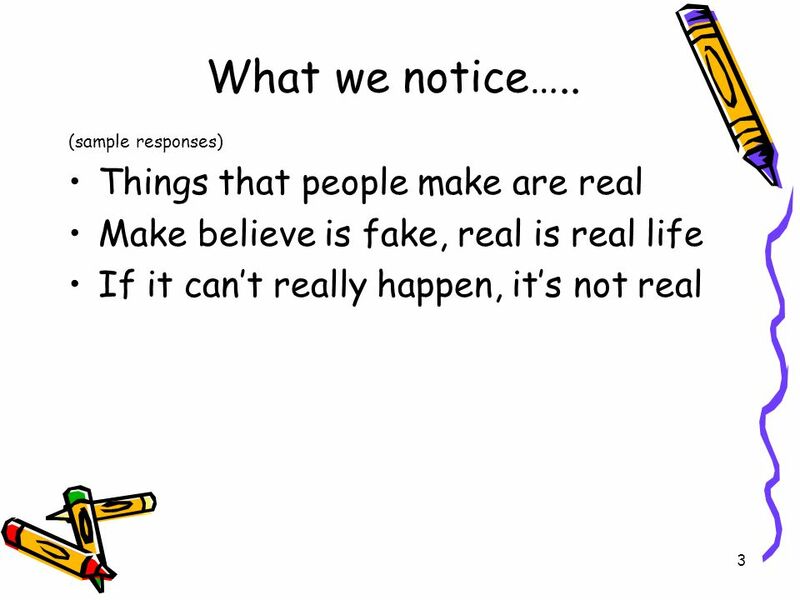 Slide Notes: Use this first set of slides (1-3) to gauge students prior knowledge about what is real and make believe. First they fill in a T-chart of real versus make believe and then they look for patterns to come up with generalizations for how they can tell the difference. This formative assessment strategy provides the teacher with information on students ability to generalize as well as how much they already know about what is real and what is make believe. Teachers can modify instruction based on the answers to these questions. 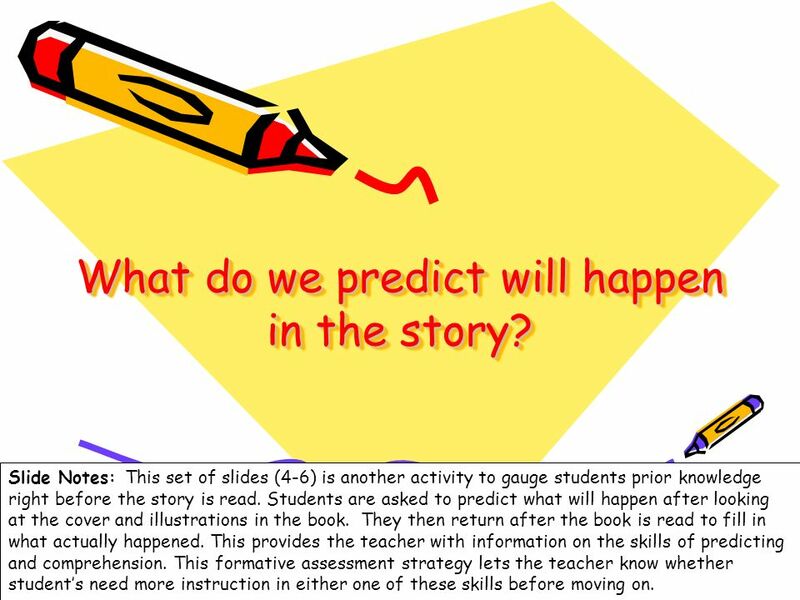 4 4 What do we predict will happen in the story? 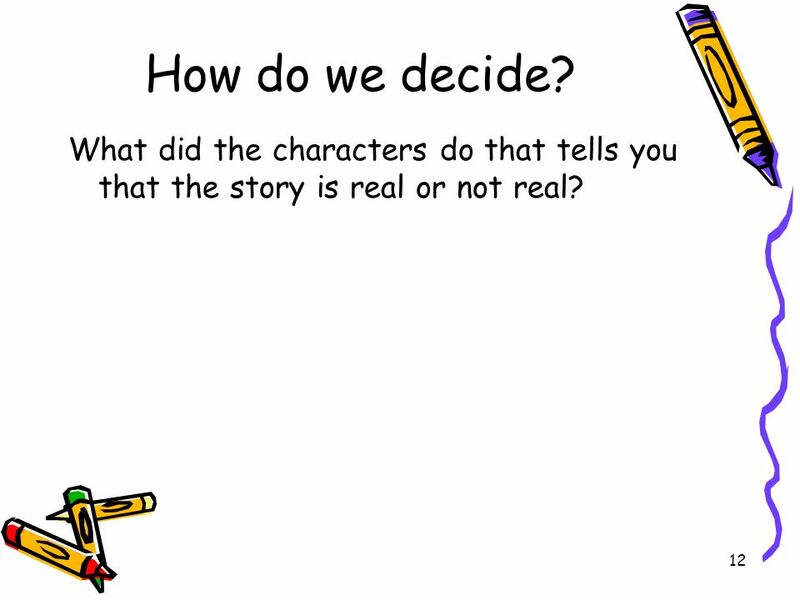 Slide Notes: This set of slides (4-6) is another activity to gauge students prior knowledge right before the story is read. Students are asked to predict what will happen after looking at the cover and illustrations in the book. They then return after the book is read to fill in what actually happened. 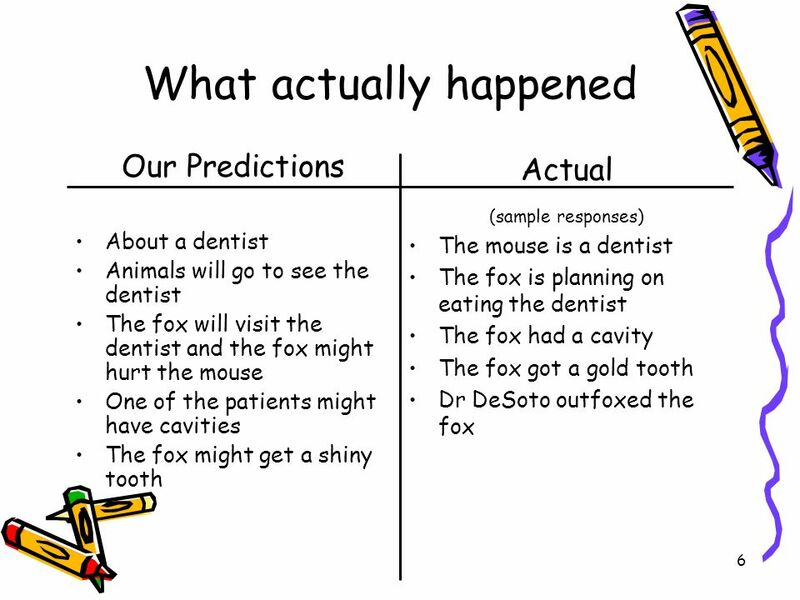 This provides the teacher with information on the skills of predicting and comprehension. This formative assessment strategy lets the teacher know whether students need more instruction in either one of these skills before moving on. 7 7 What connections can we make, what did we observe, and what do we wonder about? 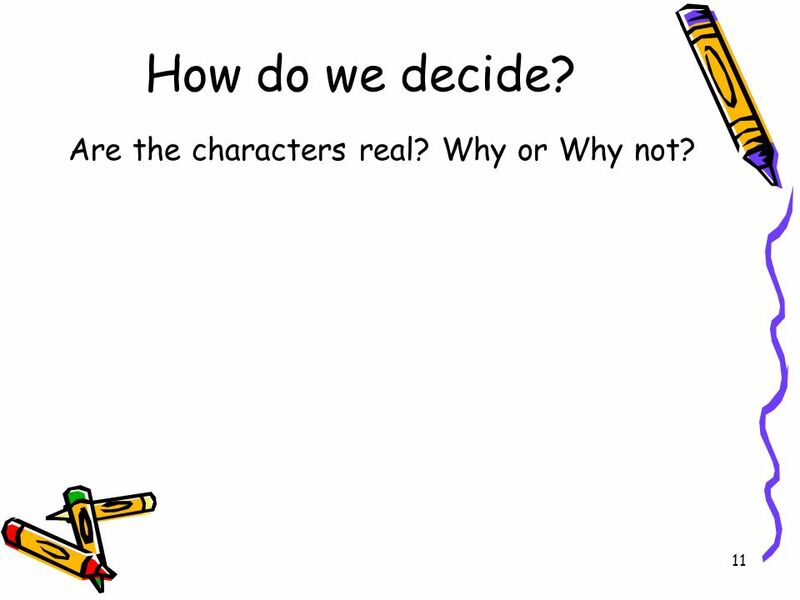 Slide Notes: This set of slides (7-8) is another formative assessment strategy that provides further information about students comprehension and the ability to connect the story to their prior knowledge and experiences, as well as the opportunity to think about questions they may still have. 9 9 Is Doctor DeSoto fact or fiction? Lets Vote! Slide Notes: This set of slides (9-17) is another formative assessment strategy that asks students to connect their prior learning in the unit to a real example. The teacher elicits student responses to several probing questions to ascertain students are ready to move on – if most students are still uncertain about the difference between fact and fiction (based on their voting responses and reasoning) more instruction can be provided. 10 10 How do we decide? Who are the characters in the story? 11 11 How do we decide? Are the characters real? Why or Why not? 12 12 How do we decide? What did the characters do that tells you that the story is real or not real? 13 13 How do we decide? What could be real in the story? 14 14 How do we decide? What is not real in the story? 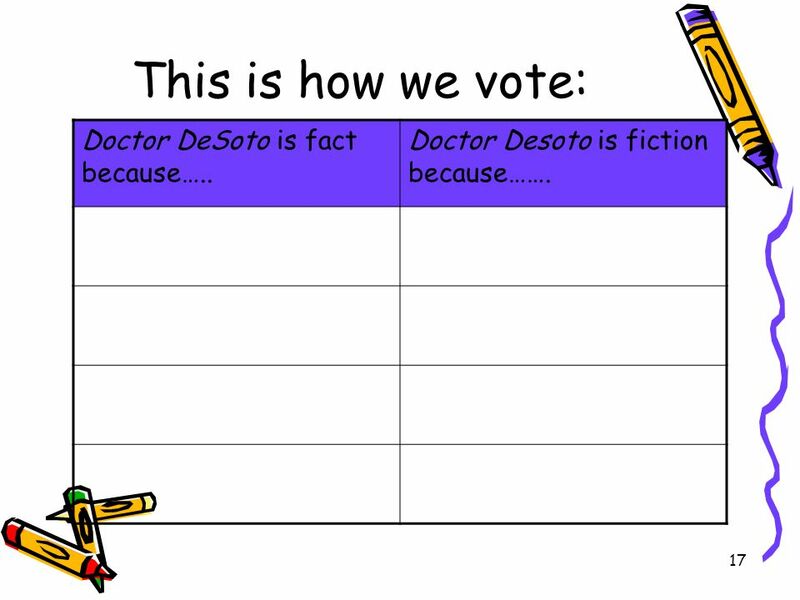 15 15 This is how we vote: Doctor DeSoto is fact because….. Doctor Desoto is fiction because……. 16 16 This is how we vote: Doctor DeSoto is fact because….. 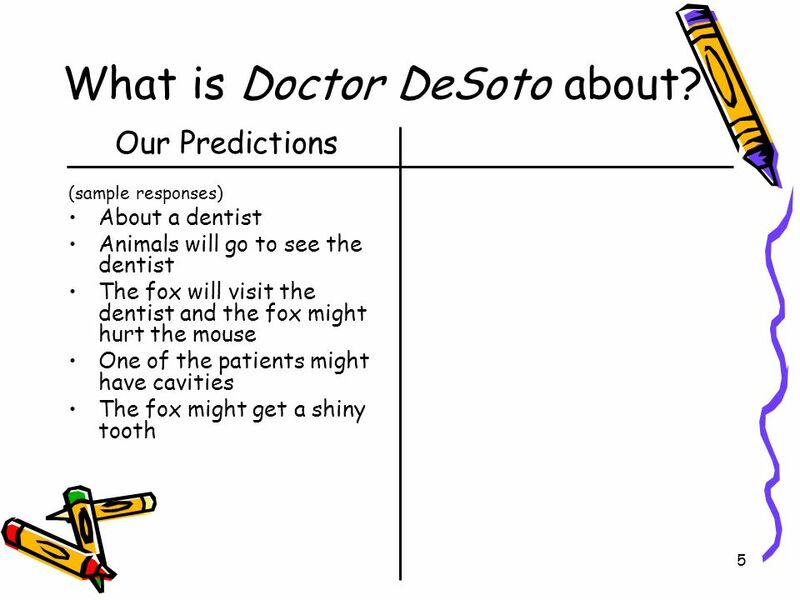 Doctor Desoto is fiction because……. 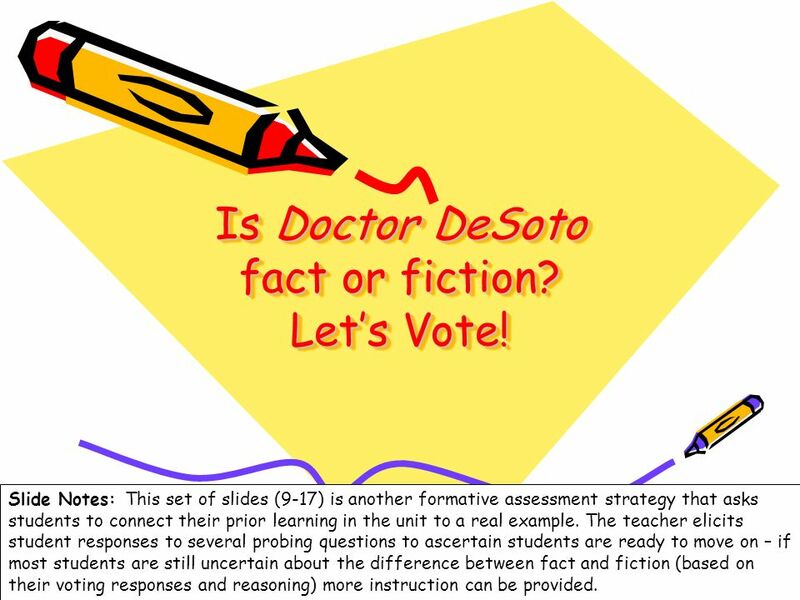 17 17 This is how we vote: Doctor DeSoto is fact because….. Doctor Desoto is fiction because……. 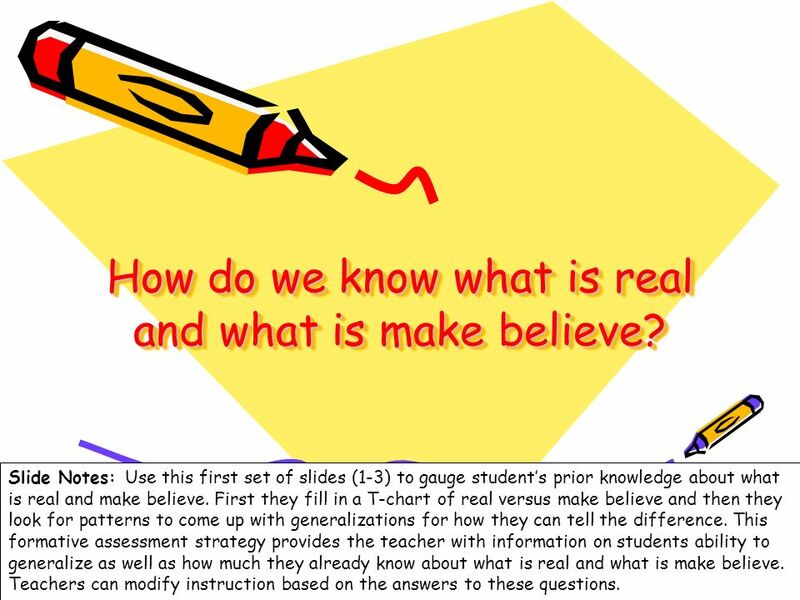 Download ppt "1 How do we know what is real and what is make believe? Slide Notes: Use this first set of slides (1-3) to gauge students prior knowledge about what is." Growing Every Child! 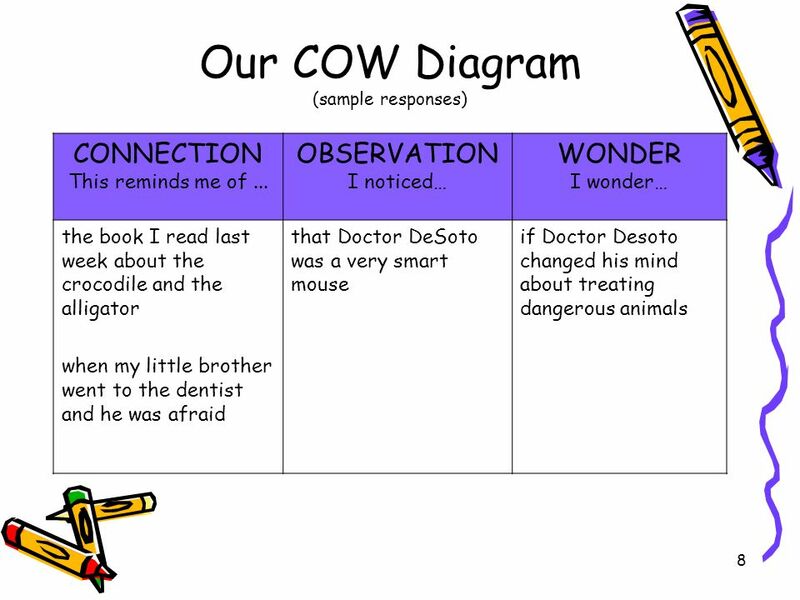 The following slides are examples of questions your child will use in the classroom throughout the year. The questions progress from. Classifying Complex Numbers Instructions The following slides list a set containing various types of numbers that you are to categorize as being strictly.